When listening to the music of New York State-based singer-songwriter C.K. Flach’s music, you can definitely hear the inner poet in him come out in his songs. The songs he writes have a very strong poetic feel to them as if they were simply poems set to music. As a matter of fact, to prove just how much of a poetic feel his writing style truly has, the artist even recorded one actual spoken piece and included it on his newly released album. Along with the poetic style of C.K. Flach’s lyrics, he also creates his songs performing the majority of the musical parts himself, with only a few instances where friends and family help to flesh out the sound of the songs. The resulting poetic Americana musical style of C.K. Flach’s songs has made its way onto the musician’s 2017 album entitled Empty Mansions. Empty Mansions from C.K. Flach begins with the track “Lazarus”. Proving that Flach’s poetic lyrical style can encompass any subject matter, “Lazarus” finds Flach making reference to a biblical character. The song about the character Lazarus being called forward in a church setting is set to a musical style that mixes some Folk elements with a few Rock and Roll ones. These elements create a track that features a slow, yet steady pace to match up with the somber lyrics. The acoustic guitar-driven track shows off some of Flach’s ability as a guitar player. The song’s slightly laidback approach allows the listener to ease their way into the new release from Flach. The new release from C.K. Flach continues with the song “Boxcar Dreaming”. While the previous track was guitar-based, C.K. Flach creates this track with keyboards. With this track, Flach slows things down as he lightens the feel of the music. While “Lazarus” was an equal amount of Rock and Roll as well as Folk, “Boxcar Dreaming” features a lot more Folk influence. The resulting track would be perfect for a Soft Rock radio format. One of the strongest tracks on the Empty Mansions album from C.K. Flach is the song “Tranquilized”. Ironically, with this song, Flach increases the energy level of the music ever so slightly instead of bringing it down as you would expect with a title like that. Although the track is still pretty laidback to the music, “Tranquilized” contains a driving feel to the guitar on the track. About halfway through, the track picks up the energy of the music. The poetic side of C.K. Flach comes out on the track “The Officer”. In a nation where those who are hired to protect are sometimes just as dangerous as the ones we want to be protected from, some people have an unfavorable opinion of the police. The song of “The Officer” is a track that deals with a scenario of a person being pulled over and not treated well by the officer doing the pulling over. The sing-song delivery of the lyrics and the slightly bluesy music make the song feel like a beatnik poem. The album continues with the title track. Throughout the release, C.K. Flach creates tracks that have a definite spiritual overtones to them. Along with the earlier track of “Lazarus,” “Empty Mansions” is one that features that approach. “Empty Mansions” finds Flach contemplating many things in life that make him question which direction to take in life. The piano and the strings in the background of the track combine to create a beautiful melody. As he sings, C.K. Flach sings about some of the sadder things that are happening in the world today. With this track, the lyrics contain one of the most somber moments on the albums. Much like “Empty Mansions” before it, the track “Machine Gun” finds Flach a very political track. The guitar and harmonica that appear on the track bring to mind the spirit of Bob Dylan, although the style of the music on the track is very much C.K. Flach. The track finds Flach speaking to those who carry guns and bring harm to men, women and children alike. Like many of the Folk songs from the sixties, “Machine Gun” is a song that speaks to those who want to bring an end to the senseless violence both here and abroad. Like the track “The Officer” from earlier in the album, the track “Firmament” once again finds C.K. Flach bringing out the poet in him. But unlike “The Officer” that features both spoken poetry and music, “Firmament” is strictly Flach as he reads his written words. The simple “voice only” track finds Flach closing out his new release with a powerful poem with a very strong message against oppression. Throughout the ten tracks that make up Empty Mansions from C.K. Flach, the listener gets to experience a poet at work as he creates song-length vignettes that deal with all sorts of things from religion to politics to everything in between. And since the album changes musical directions throughout those ten tracks, there is plenty of variety to help form a truly unique release that stands out against most of today’s commercial albums. To hear a little bit of the music from C.K. Flach, check out the title track for Empty Mansions. Folk band Sweet Sweet formed in 2014 in South Carolina. Jeremy Dunham’s vocals and guitars and Kerrine Gifford’s vocals and cello place the sound of the duo into the Folk category. The duo’s sound has plenty of that folk quality to it while still somehow pushing the envelope. There is more to the duo’s music than just the familiar feel of folk music. Together, Dunham and Gifford create a unique sound that should appeal to not only folk lovers but maybe even Indie Rock lovers, as well. As a way of getting their name out there, Sweet Sweet recently participated in NPR’s Tiny Desk Contest. For that contest, they performed their song “Remind Me”. That track and others appear on Sweet Sweet’s newest release entitled In Tandem. In Tandem from Sweet Sweet begins with the track “To the Stars”. The beginning features a light feel to the music but with a quick pace. That lightness to the music is quickly swallowed by a more complex feel. The music swells as the cello and guitar seem to be built up in order to create a sound that is much larger than just two instruments. The resulting sound contains plenty of folk-like quality to it, but it also has a little roots rock influence as well. The folk/rock feel of the music seems perfect for radio formats such as Top 40 and/or Hot A/C (Adult Contemporary). “To the Stars” is such a strong track that it could garner the duo plenty of airplay on radio. Sweet Sweet continues their newest release of In Tandem with the song “Daylight”. “Daylight” finds the duo of Jeremy Dunham and Kerrine Gifford creating a track that is closer to folk-rock than the previous track. Dunham and Gifford blend their guitar and cello together to create a sound that is perfect for folk music. The lightness in the music lends itself well to Dunham’s lyrics about spending time with the one he loves. “Daylight” is a wonderfully light track with an easy pace to it. The next track on the In Tandem release from Sweet Sweet is the song the duo chose to do for their Tiny Desk Contest submission, “Remind Me”. The track begins with a strong passage that features both Jeremy Dunham and Kerrine Gifford creating a duet of sorts with the acoustic guitar and cello along with a strong beat. The blending of the two instruments into one creates a nice harmonic sound. Dunham and Gifford develop the track further and the duo make good use of their folk influences to make a track with a duet style to the lyrics. The addition of the glockenspiel and the production values on this song make the song one of the strongest moments on the release. In Tandem continues with the song “Cellars and Closets”. The vocal sound of Jeremy Dunham and his delivery of the lyrics on this track bring to mind the style and sound of Colin Hay from Men at Work. Dunham brings the same type of delivery as Hay’s style to this song. Just like the previous song on the release, Sweet Sweet adds many different layers to the music to give the track plenty of body. The light addition of the electric guitar on the track adds a very subtle but beautiful touch to the music. The resulting track brings to mind not only Colin Hay, but also Jack Johnson. The track’s various aspects combine to create yet another moment on the release that needs to be heard. The In Tandem release from Sweet Sweet comes to a close with the track “Lost Kids”. The light cello from Kerrine Gifford and acoustic guitar from Jeremy Dunham at the beginning of the track along with the poetic lyrics plus vocal quality from Dunham all combine to create a track that brings to mind something from Simon and Garfunkle. In fact, “Lost Kids” sounds like it easily could have been a lost track Simon and Garfunkle’s classic album of Sounds of Silence. The track’s beautiful quality brings the release from Sweet Sweet to an end on a strong note. Jeremy Dunham and Kerrine Gifford seem to complement each other well as both musicians and singers. Together, they make for a very strong writing and performing duo as Sweet Sweet. The duo’s In Tandem release is extremely strong throughout the EP’s five tracks. And with no low points, In Tandem is the type of release that makes the listener beg for more once the final note plays out. To hear some of Sweet Sweet‘s music, check out their video for “Remind Me,” the video they made for NPR’s Tiny Desk Contest. Click on the album cover for In Tandem by Sweet Sweet to purchase a copy of the release. Singer-songwriter Thor Platter is currently making a name for himself. Having been named to many different lists in various publications in and around the Cleveland area, many people are becoming aware of the Cleveland-based singer-songwriter. But just like singer-songwriter Mike Farley before him who moved to Cleveland from Long Island, Platter didn’t start out as a Clevelander; Platter moved here from Buffalo, New York. Since moving here, Thor Platter began creating music. Aside from making his own music, Platter had also been part of a band called The Whiskey Lock, a Bluegrass/Americana band that also included Josh Haney and Tricia Zook. But since that time, Platter is now more focused on making his own music. Currently, Platter has released one album of music called Looking for Sunshine. Having already released that one album, Thor Platter is about to add to his musical library with a new five-song release called Long Road Ahead. To bring this new album to life, Platter called upon some of Cleveland’s most talented Country/Folk musicians. The musical line-up for this release consists of: Thor Platter – Acoustic guitar & Vocals; Matt Charboneau – Upright Bass; Tommy Hannum – Dobro on “Ride” & “Long Road Ahead”; Paul Kovac – Banjo, Mandolin on “Long Road Ahead” and Bill Lestock – Mandolin & Fiddle. Together, the players create a very strong musical ensemble that handles the music flawlessly. Long Road Ahead from Thor Platter is a mixed bag of music as it contains both original tunes and tracks written or co-written by friends of his. The release begins with the track “Lake Erie Shore,” a track penned by Platter’s former Whiskey Lock bandmate Tricia Zook. “Lake Erie Shore” features lyrics written by Zook after she left the Cleveland area for a job that took her to North Carolina. The track features the talents of Platter on guitar and vocals, Matt Charboneau on Upright Bass, Paul Kovac on Banjo and Bill Lestock and mandolin. The heartbreaking lyrics about being away from one’s love feel very appropriate for Bluegrass music and the performance of the song by Thor Platter and the rest of the musicians on the track create one of the best modern Bluegrass tracks. The new release from Thor Platter continues with the track “Josh’s Manifesto,” a track co-written by Thor Platter and Josh Stevens. Like the first track of “Lake Erie Shore,” “Josh’s Manifesto” features lyrics about love but from the other direction as the singer sings of being free of the spell of his “ex”. The lyrics of the song deal with the touchy subject of separation with as much humor as one can. The track has already become a staple of Thor Platter’s live set. With the next track of “Ride,” Thor Platter and the rest of the band create possibly the most creative song on the relatively short release. While much of the new release find the musicians creating songs that fit into the Bluegrass genre, “Ride” also includes some musical elements that make the listener classify the song as more like “Americana” than straight Bluegrass. Along with the interesting playing from the band that set the track apart from the rest of the EP, the production value on the track adds a lot of character to the track. The track makes the listener feel as if they are part of some sort of film noir movie set to music. “Ride” ends up taking the music of Platter in a much “darker” (and much more interesting) direction. One of the older songs to be included on the release, “Ride” ends up being one of the strongest moments on the new EP. After one track that breaks the mold for straight-forward Bluegrass music, Platter and the musicians return to a more straight-forward Bluegrass style. In fact, the resulting track brings a lot of “Old Timey” feel to the music. The banjo, acoustic guitar and fiddle all bring the listener back to the early days of the 20th Century. For those who are fans of Bluegrass music, this is easily the track to hear. Long Road Ahead from Thor Platter comes to a close with the title track of the release. Like “Ride” before it, “Long Road Ahead” finds the band creating a track that feels very fresh. Along with the omnipresent Bluegrass sound, the track also features a little folk thrown in. The combination in the music works as the song feels as if it could fit onto several different radio formats. While the EP is not very long, Long Road Ahead from Thor Platter is a strong EP. The five tracks included are different enough from one track to the next that the playing time seems too short. For a musician who has previously released only one album, Platter has created a very solid EP in Long Road Ahead. 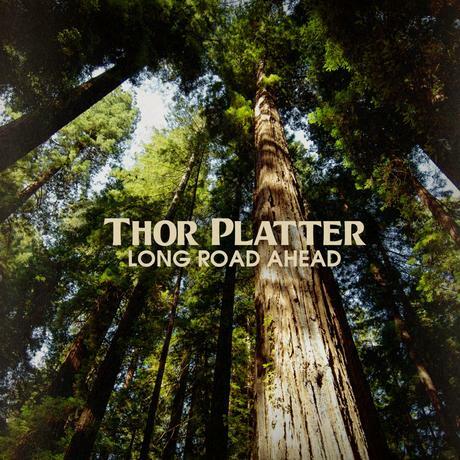 To hear just a little of Thor Platter’s music, check out the song “Ride” off of the new release of Long Road Ahead.